... for my Aunt Audrey's memorial service, in Bay City. She was 85, I think, and suffering from had Altzheimer's. Demetrios and Mom and I are all going up together in Mom's car. Ten hours or so driving time, not counting stops, from her house; two more from our house to hers. Bad weather expected. At least it will be good to see Uncle Bob and all those cousins again, and their families. Not that it matters, but it's my birthday and this is not the way I'd hoped to spend it. Then again, in the circs., it's obviously the very best way. Here in one (of countless) variations of "The Harrowing of Hades," the icon all Orthodox churches display on Pascha and all during the paschal season. It's a good example of my all-time, far-and-away, favorite icon, so I thought I'd share it with you. Christ is emptying hell. He has begun with Eve, who looks on somewhat sleepy-eyed still, as if in a daze; and at the moment depicted, He is in the act of raising Adam, who always wears a look of astonishment. "Who, me?" he seems to be asking. "Me, of all people, whose sin caused such deformity to human beings and caused so much grief to all succeeding generations? You're raising ME to new life?" On one side of Christ stand the Old Testament patriarchs, prophets, and kings - or at least a representative sampling of them, while on the other side are (some of) the Apostles. Together with the angels above, they all look on in utter amazement, some of them turning to each other to see if anyone can comprehend. You can recognize St. John the Forerunner (Baptist) by his disheveled look and by his performing his usual task, pointing out the Christ, bearing witness to Him. St. John's hand, or at least his finger, always penetrates the "mandorla" (almond-shaped or egg-shaped aureole around Christ). That mandorla signifies a different dimension, something happening not in ordinary space and time. Christ is standing upon the Gates of Hell, which He has smashed open. They are shown in the shape of a cross, by which He has gained access to the dark domain. Below Him, in the pit, lie hell's locks and hinges, broken to pieces. Christ is shown larger than anyone else, signifying that He is more alive than anyone else; in fact, He is the only One Who has Life in His own right, as a property of His own nature, whose being is non-derivative, uncreated. Even His garments seem alive, radiant and flowing in the breeze, seeming almost ready to fly. As always in any icon, you're looking at reverse perspective; the far-away mountains (yes, those are stylized mountains) appear huge, as if nearby, and the angels in heaven are larger than the people nearby. Reverse perspective makes all the icon's lines converge upon you. It makes the scene open up into infinity (instead of closing at a finite point ahead of you). Because of course it is all about God's love for you and me. One thing that continually astonishes me is my reluctance, so often, to follow where the Holy Spirit leads, when all He is asks me to do is (in part) for my own good, my own healing, my own well-being and joy. What's with that? This is the Spirit of Love! This is the One Who loves me better - infinitely better! - than I love myself. This is the One Who, when we do follow Him, floods us with peace and joy and hope and gratitude, to the point of tears. Good tears, I mean; the kind you wish would never cease. I suppose it's like going to the dentist. I do that reluctantly, too. That's not my idea of happiness! No, but having my own teeth is. And having them free of toothache definitely is. One consolation is that even when we follow Him reluctantly, with none of the above, He can take the smallest act of obedience and do great things with it. Saturday, I had the talk with my niece, Elizabeth, who is soon to be 11 years old. Thought her mother would want me to, and knew her father did, because I asked him ahead of time. Told her by no means everything, just what she will need to know in the near future. Her questions made it obvious she'd had no clue, although she had heard "PMS" on television a couple of nights before and wondered what it meant. This amazes me, in a refreshing way; I had supposed these days every child above the age of six could give me a full lecture on the Facts of Life. We talked some about her mother, and another thing struck me: I enjoy my sister's company in dreams fairly regularly, but I have never once dreamed about my father since the day he died. What's with that, I wonder??? When I was a little girl, I used to wonder why so much emphasis was put upon Jesus, Who, it seemed to me, was stealing quite a bit of the glory that ought to be given to God. Easter was perhaps the worst example of this, in my mind. I was a long way from Pascha. When I grew a little older I began to understand that Jesus was and is God, so there was no glory-stealing going on. I no longer minded congratulating Him on His glorious resurrection. In fact, it was a matter of personal loyalty to him. But of course that idea of what it was all about was still not yet Pascha. In my adolescence, I saw the resurrection as necessary to make the story come out right; God must triumph. But that was not yet Pascha. But of course pride was not yet Pascha at all, was it? Pascha is about God's love being stronger than suffering, any suffering, and stronger than death. Pascha means Christ has parted death's dark waters and brought the entire human race to the other side the dismal sea. It means "death" is now the portal to new life, for every single human being, whether we know it or not, whether we believe it or not, even whether we like it or not. 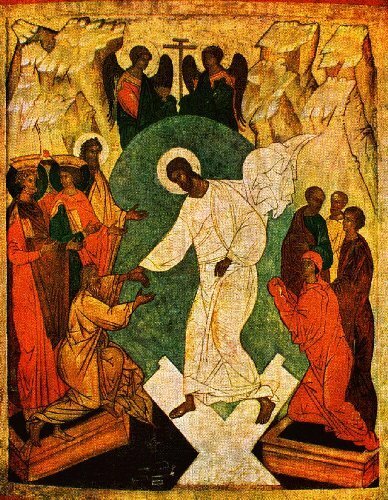 Pascha means that given such Love and such Might, we can confidently hope, indeed know, that in the fulness of time, at the time the Lover of Mankind knows is best, He will put a definitive end to all suffering, will reverse all evil, will wipe away every tear, will make everything infinitely better than just okay. Bright and early this morning came a knock on the front door. It was the Jehovah's Witnesses with whom Demetrios had had a whole discussion several days ago, come with reinforcements "to finish our conversation." Demetrios greeted them with, "Christ is Risen!" and they gave him a blank look. He explained he was just getting ready to leave for church, so they departed. But they'll be back. That's what happens when once you let them in the door. It wasn't the scourging. It wasn't the slapping or the mocking or the spitting or the nails or the cross or dehydration or asphyixiation that killed Christ. It wasn't the human malice we see at work, it wasn't our sins, it most assuredly was not God the Father (! ), and it wasn't satan the adversary, either. Half His hearers (v. 19) thought He was mad when he said this, or demon-possessed. But let us cry, "Christ is risen! He is risen indeed! Alleluia!" May your Pascha and paschal season be wonderful and blessed, as we celebrate the annulment of death by the Conqueror, the true Joy, the only Joy, of this world. He is true joy because He is eternal. Without Christ there is no joy, because everything ends in death and grief and nothingness. But because of Christ, there is unending life for everyone. By His mere presence there, He turns the tomb into the fountain of life, Hell into Paradise, the grave into a bridal chamber. He is pure Joy because He is pure (unmixed) Love. He is deepest Joy, because His is not the sort of joy that is the opposite of sorrow, or that can be lost through sorrow. His Joy is the kind that shines through sorrow, that can even transfigure sorrow into another form of blessed communion with Him - and with one another. In the service for Holy Thursday evening, much mention is made of God's being "very merciful" and we also sing of how Jesus said from the Cross, "Forgive them, for they know not what they do." Then again, we chant about how wicked the deeds of Israel were, handing over their Messiah to Gentiles for crucifixion. And that truly is remarkable, when you think about it the way the hymns put it, that the Jews should give gall and vinegar to Him Who fed them manna in the wilderness, that they should prefer the death of the Messiah to His Love, that they should torment Him Who healed them, that they should kill Him Who raised their dead, etc. So far, so good, but then there are a couple of times when pray, "Do unto them, O Lord, according to their deeds." That's certainly not how we pray for ourselves! Oh, no; then what we pray is, "Deal not with us according to our deeds, but according to Thy great mercy." So I don't get it. I know in my heart this is not a piece of anti-Semitism, yet I can certainly sympathize with the complaints of Jews who think it is. It hardly seems a Christian attitude, in any case. Demetrios also points out that the people who put Christ to death ARE forgiven, unless we care to imagine the impossible, namely that Jesus' dying prayer was ignored., or that His forgiveness was not shared by the Father and the Holy Spirit. We also know that nobody, Jews or Romans or anyone else, could kill the Immortal One, Who laid down His human life voluntarily and died when and how He had chosen to and "gave up the ghost" not from anything done to Him, but from His own free will. It's not that "the Jews killed Christ." As He said to Pilate, "You would have no power over me unless it were given to you from above." And there's one more clue I can think of. We know we are all responsible fior His death, in the sense that our sins put us in a position from which only the Almighty Lover of Mankind could deliver us, and that, only this way. But, these few clues notwithstanding, I'm still stumped. I'm also absolutely sure I am not the only person who has ever wrestled with this issue. So I'm hoping somebody amongst you knows the answer and will share it: What's with this "Do unto them according to their works" bit? Blind faith? Just don't do it. It's all a matter of what we have seen and heard and touched, nothing blind about it. Faith is not something blind, but is the Light the Holy Spirit sheds in our core being. People who argue for blind faith lack this communion in the Holy Spirit, leaving "blind faith" their only option if they wish to be religious; do not listen to them. Just don't. Don't do it. If you are a chrismated Orthodox Christian, you have been given the indwelling of the Holy Spirit, and you need to keep attuned to Him. You need no man to teach you, says Christ. The Spirit of Truth will guide you in all things. Yet we do have teachers. We do have spiritual guides. And yes, obeying them is a major, major virtue. But it just isn't supposed to be blind obedience. It's supposed to be the kind of obedience to which your own conscience, informed by the Holy Spirit, gives full and free approval. Blind obedience is demanded by people who wish to control you, to gratify their own passions. And, conversely, to offer blind obedience is a temptation to those who wish to duck responsibility, and leave all decisions in the hands of someone else. That's not what obedience is all about! Obedience is about learning humility, about learning to stop demanding to have everything our own way, about not trusting our own fallen ideas and conclusions, about learning the path from someone further along it than we are. But we still do not get to duck responsibility. And a good spiritual father or mother will not let us. A false one will, and when we combine someone who lusts after control of other people with someone who wants to evade responsibility and decision making, the combination is toxic. Poor Mary of Bethany; it seems she came in for a lot of criticism. In this case, she pours perfume all over Jesus' Feet and dries them with her tears, and Judas complains she's wasted good money. Jesus has just recently raised her dear brother Lazarus from the dead! What's a flagon of even the costliest ointment, from a heart overflowing with that kind of gratitude? What's she supposed to do, send Jesus a flower arrangement or a thank-you card? This is was what was in my heart in church this morning when I heard Demetrios' sweet voice beside me, singing the hymn, and in a flash I remembered him saying, two weeks ago, "I think I can discern the protective Hand of God over me," and then I heard the surgeon saying, "I do pray before every operation, that the Hand of God will be at work," and I thought, "And the same Christ who gave Lazarus back to his sisters has also given me back my Demetrios," and that's when I began crying. Mary, Mary, can you please pour your pure nard over His Feet for both of us? O Christ, I have no perfume; all I have is this poor heart and life, and they don't smell very good. I just about had those tears under control when it occurred to me I have no business still being alive either, with my heart condition. Yet, even when I forget to take my pills, He keeps me alive. I was just drying those fresh tears when yet another flood came, for I remembered how He raised me from the death of sin - which is why, when I became Orthodox, I took the name Anastasia, "Resurrection" - and then it hit me how He is constantly raising me from that death, for I constantly sin. So physically and spiritually, He is keeping me alive every moment - and keeping all of us alive, and if He were to withdraw His sustaining Hand from us for an instant, we'd be gone. We are all Lazarus. And that's one way we KNOW that when we come to our departure from this life, it will be because it is the right time for us, the time our tender Shepherd has chosen for us, with our best interest at heart. That's the kind of King He is. O Israel, you have missed the point! He didn't come on a war-horse; He isn't the kind of revolutionary you wanted, to liberate you from Rome. His kingdom lasts forever and ever, say your prophets, so you know it can't be a political one, for no political kingdom can last forever; it has to be a spiritual kingdom. He is the King of Life and the Vanquisher of Death, and His might is His Love, and His glory is His Love, and His Kingdom is Love. Hosanna in the highest! Blessed is He, Who comes in the Name of the Lord! "I am proud to have been cared for at XYZ Hospital." Proud to have been sick in a hospital? "I cannot imagine a world without XYZ Hospital." ??????? Demetrios laughed for a good five minutes over those, and when he recovered, he was rather annoyed. Health care costs might be reduced by a good bit if hospitals were not paying polling companies to ask how eager I am to be hospitalized there again. P.S.) Another way to reduce hospital costs would be to save those multi-thousand dollar, computerized beds that do everything but count your hiccups for patients who really need them. A letter I received from a doctor's office has a notice at the bottom in very small type saying this is a confidential communication intended for the individuals(s) or Entity to whom it is addressed, and if I am not the addressee, I should please not read this. You can find a very good series of posts on the Resurrection over at Heart, Mind, Soul and Strength. Anne is a careful thinker and a devoted follower of Christ, and I believe her posts deserve wide readership, which is why I have linked to her blog on my sidebar; and you'll notice this is a rare exception to my rule about non-Orthodox links! One post, though, startles me; it's this one, on atonement and forgiveness. It's in response to a critique of Christianity; and its premise is that atonement involves our guilt being vicariously punished in Christ. That's not terribly surprising, given that the author is Lutheran. But I'd still like to take a look at the reasoning offered for such an assertion, and to suggest that the attack upon Christianity could be better rebutted. When we look at our own guilt for various things we have done, we know that our simple regret – as genuine and miserable as it may be – neither works to destroy the evil that is in us nor satisfies those we have wronged. As for satisfying those who were wronged, God does ultimately satisfy them, just not by punishing us. (Chastisement for our correction, yes; punishment in the sense of retribution, no.) Punishing does nothing to restore to those who were wronged anything that had been unjustly taken from them. It merely gratifies their lust for revenge, which is hardly a Christian attitude. God, though, ultimately does restore to everyone whatever is good for him, and many times over. While on the surface the idea seems attractive that God might forgive us without any punishment, if that had been the case then we would have concluded that wrongdoing was not really that serious. If God only “forgave” with punishment, then there would actually be no forgiveness. It would mean He collects the full price, which is the exact opposite of forgiving the debt. It would mean He merely lets us off the hook. This is not the same as forgiving and because of the terrible terms, is no longer beautiful, either, as forgiveness is so very beautiful. As for our regarding sin as not really that serious, there’s no way! Regardless of which atonement theory we espouse, we cannot look at Christ on the Cross and imagine this is insignificant, or is a way of dealing with some trivial matter. And we would have concluded that wrongdoing was not very serious based on what (in that case) would have been fact – that God simply shrugged and forgave. It certainly would not have been fact. God never simply shrugged when He forgave. His forgiveness took the form of dying to destroy death! And all that’s just the icing on the cake, the cake being the whole long saga of salvation history beginning in Genesis. And the story doesn’t end with His forgiveness, either. Instead of just shrugging as if nothing had happened, God makes like the father of the Prodigal. He robes us with new clothing, puts a ring on our finger, arranges a feast. That is, He restores us, transfigures us, deifies us. That said, it isn’t as though the forgiveness itself were at all difficult for God. He didn’t have to wrestle with Himself over it or struggle inwardly or anything. The forgiveness itself was the very, very easy part; putting it into concrete effect was the amazing feat. But if God was willing to redeem anyone, no matter how serious the offense, then how would could we keep any idea of justice, that [some]thing had genuinely been wrong? If God chose to merely overlook a sin, no matter how serious, then what about the harm that had been done and the vileness of some of the actions that were forgiven? The supposition here seems to be that to forgive outright, without punishment, is merely to overlook. Not so. Far from overlooking sin, God spends all of human history working to defeat it, that epic war reaching its climax upon the Cross and its promised consummation at the end of time. As for the harm done, punishment-based “justice” does nothing whatsoever to undo the harm. You can put to death the murderer, but that will not bring my loved one back to life or back to me. You can put the child molester to death, but the child can never be un-raped. The aggrieved will still grieve. As for the vileness of the wrongdoing, that very vileness displays the love of God all the more greatly when the sinner is transfigured in Christ into a tear-drenched saint, spending his time loving and praying and doing as much good as he can – when Saul of Tarsus becomes St. Paul, for example. So we begin to look at justice rather than merely overlooking the wrong. What is the worst punishment that justice can ask? Jesus’ punishment – the extreme punishment of death, reserved for the worst of crimes – is sufficient to satisfy justice for the most serious of offenses. In fact, even fallen human justice is not at all satisfied by an innocent man dying while the guilty go free. (How would a victim’s family feel, or the community feel, if a serial killer were let off the hook and some innocent volunteer were executed instead? Some justice! No, we all know this will not do; that's why even devout believers in penal atonement do not seek to imitate the Lord by going before a judge and asking to be allowed to take the sentence in lieu of the convicted person. They all know this will never satisfy justice.) Nor is justice satisfied when a debt is owed by paying the creditor with money taken from his own account. Or by God the Father requiring to be repaid but God the Son not requiring it. Doesn’t justice require the Son to collect the debt we owe Him, as much as it had required the same of the Father? In this way our atonement has left no doubt that the wrongs being atoned are not a slight matter but are in fact dreadful. This is evident in any case when we behold the Cross and see what the Savior had to endure in the course of conquering death and defeating satan. In this way our fear is quieted as to whether our particular sin is beyond the price that was paid. Demetrios is my Christ-with-skin-on, my joy and delight, the love of my life, the only person I can imagine myself married to. Thank You, Lord, with all my heart and tears of joy. Make me worthy of such a man! Dan and Becky are the founders of the Sts. Cyril and Methodios Society, a Catholic-Orthodox discussion group that is largely defunct now, except for occasional get-togethers, of which this is one. Should be interesting. Not, of course, productive, as lay Catholics are powerless to make any of the changes that would make unification possible, but at least it's good for friendship. "Set a guard over my mouth, O Lord, and a gate between my lips!" True Mother of God, we magnify thee. These verses used to vex me. The Mother of God, more glorious even than a cherub or a seraph? During my catechumenate, I came to two conclusions, neither of which fit very well with the other. The first conclusion was that after all, any human is a higher order of being than any angel, because angels are and always will remain servants of God and man, whereas humans are destined to become God's sons and daughters. The second conclusion was that this Mary business was a bit overdone, but I would become Orthodox anyway, because after all, "we have this Treasure in earthen vessels," as the Apostle says. So this vessel called Orthodoxy was a bit cracked; who cared? It still contained the Treasure. It wasn't until much later I realized there was no crack. Or as they say in the computer world, it isn't a bug, it's a feature. the divine purple robe worn by the King of angelic hosts. You held in your arms the One Who holds all things. O all you His works, unto all the ages. So in addition to the intimacy she had with God in her surpassing faith and love and innocence, she had the unique intimacy of carrying in her body for nine nonths the King of Creation. What angel ever had that honor? She lent or rather gave Him flesh from her own flesh; which of the bodiless angelic hosts could ever have that glory? She fed Him with her own milk; no angel could aspire to this. Nine months of the eternal God growing in and from her flesh, uniting Himself both spiritually and bodily to her in the most intimate way imaginable (if this even IS imaginable)! No other creature that ever was had such a relationship with God. Not even the angels. More honorable than the cherubim, And more glorious beyond compare than the seraphim - DUH.